This product is designed to reduce pain over the bunion joint. 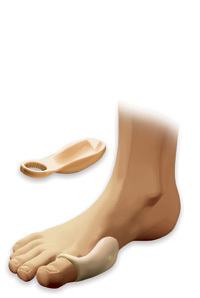 The Silicone Bunion Shield has proved an effective solution for bunions by providing cushioning and support. It deflects undue rubbing from the shoe, absorbs lateral shock and prevents friction. A strong elastic fibre is woven within the loop for added strength. Suitable for left and right foot.